I live in Devon, Pennsylvania with my husband and two daughters. I have been cooking happily since I was around 7. I grew up in a large family and as the youngest child in the family, I spent a lot of time helping my Mom in the kitchen. I learned all the fundamentals from working by her side. Growing up, I enjoyed lots of time playing with friends, camping, doing crafts and cooking. I was always drawn to the old PBS cooking shows, cookbooks and cooking/home magazines. After college, I taught second and third grade for twelve years before starting my family. I have recently returned to the classroom and currently teach third grade as a long-term substitute. I love all aspects of food: the colors, the aromas, the textures. It is my passion! I love trying to cook anything I haven’t attempted before. I love experimenting with new techniques. I try to perfect dishes I’ve prepared lots of times. I always want to develop the best way to prepare a dish and serve it in an inviting and beautiful way. Watching people enjoy my food makes me happy. When I go out to eat, I always love to try something new. I find inspiration in every menu and meal. I entered my first contest, the 44th Pillsbury Bake-Off in 2010 on a whim, I think I had seen an ad for the contest in a magazine. I figured I had nothing to lose and in this economy who couldn’t use some extra cash. I was shocked when I got the call months later that I was a finalist! I immediately wanted to find out more information about the Bake-Off and see what other contest opportunities were out there. One Google search brought me to Cooking Contest Central. From that point on, the cooking contest bug had bitten me and I was reading about contests, researching and entering contests whenever I could. I never knew there were so many great people with this common interest and I just loved the way everyone supported each other. I remember reading about the CCC Hall of Famers and just being in awe! I had just discovered this cool world of cooking contests and here are these super stars with ribbons, crowns and huge smiles. I wanted to feel what they were feeling in their photos! I entered lots of contests and most of them were not wins, but when I did hit on a win, it fueled me to keep going. I learned not to let yourself get discouraged by those contests you don’t win. It does not necessarily mean the recipe was bad, it just wasn’t what the judges or company were looking for at that time. You just have to keep entering because if you keep trying, you will hit on something eventually. 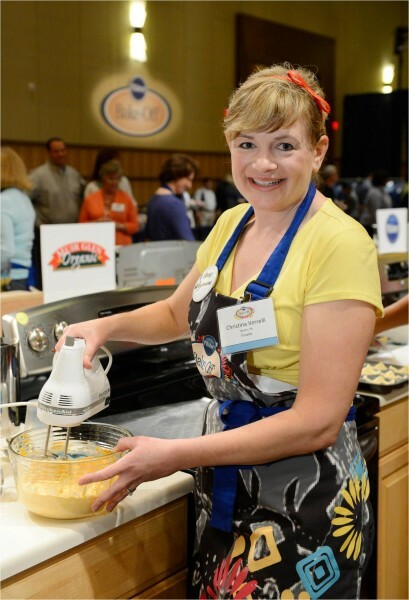 My biggest win came at the 45th Pillsbury Bake-Off held in March 2012. It was my second time as a Bake-Off finalist. I never thought I was going to be a prize winner, I was so thrilled just to be there as a finalist again. I couldn’t believe it when Martha Stewart revealed my recipe as the grand prize winner! It still feels like an amazing dream!! Since my Bake-Off win, I have spent lots of time giving demonstrations and talks to community groups and have made many, many thousands of pumpkin ravioli to share (my Pillsbury winning dessert). I also have started sharing my original recipes, food stories and cooking contest adventures on my food blog, www.epicuricloud.com. I needed to find a better forum for my passion, as I have become a menace in social situations, always carrying on about my latest culinary experiments! This endeavor has been such a great learning experience and has allowed me to connect with so many wonderful people. It thrills me to no end when someone makes one of my recipes and let’s me know that they enjoyed it and were successful with my recipe! Most recently, I competed on the Food Network’s new series, America’s Best Cook. It was the most intense, nerve-wracking and exciting competition I have ever experienced. It was an honor and a thrill to have the opportunity to learn from iron-chef mentors, cook for celebrity judges, meet amazing cooks from across the country and get to hang-out at the Food Network studios. I managed to survive on the show for all 6-weeks and ended up being the runner-up! I am still pinching myself! Food is a great way for me to express my creativity and share with others. Nothing makes me happier than seeing a big smile on someone’s face after I cook for them. Food brings people together and is integral to our family, culture and traditions. My journey with food has provided me with so many new experiences and great friends. I am so grateful for all that I have been able to learn and do. I can’t wait to see where my food journey will take me next! Fabulous Tina! Big congrats on getting inducted in the CCC Hall Of Fame! It couldn’t have happened to a sweeter person! Good luck with your future entries, and I hope we get to meet up again soon!!!! Congratulations, Christina! It was such a pleasure to watch you compete on America’s Best Cook. I am sure there are many more wins in your future! way to go my PA Friend, CHRISTINA!!! You go girl 🙂 !!! 🙂 Congrats!! well deserved!! Congratulations, Christina! You were amazing on America’s Best Cook — the epitome of grace under pressure. I enjoyed reading this Q&A. Congratulations Christina! I loved watching you on America’s Best Cook and I really enjoyed this follow up story. You are truly an inspiration to me as a new contester without a win yet. Perfect addition to the CCC Hall of Fame! Congratulations, Christina. I’ve always loved your recipes and it was a pleasure to finally meet you. Finally got to watch America’s Best Cook and you were fabulous. You are eternally in the Hall of Fame.